Easily clone OneNote page titles to your favorite task app. 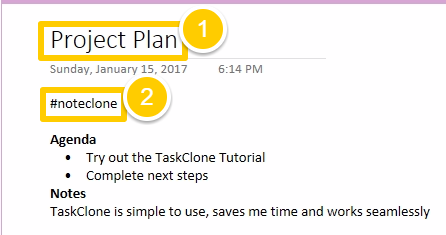 TaskClone also clones OneNote checklist tasks as tasks into your task app. Find or create a OneNote Page. Add "#noteclone" in the page to initiate the process. Add anywhere on the page except in a table. NOTE: the noteclone tag is built-in to TaskClone so please do not add it to TaskClone settings. When OneNote Syncs > TaskClone is notified and sends the page title to your task app. When TaskClone is finished > it replaces the "#noteclone" with "#noteclone-cloned" to indicate the page title has been cloned. You must sync again or wait for OneNote's auto-sync to see the changes TaskClone has made. Important! Do not edit the note again until you see the trigger tag is replaced Also, TaskClone will only process the same page once every 2 minutes.